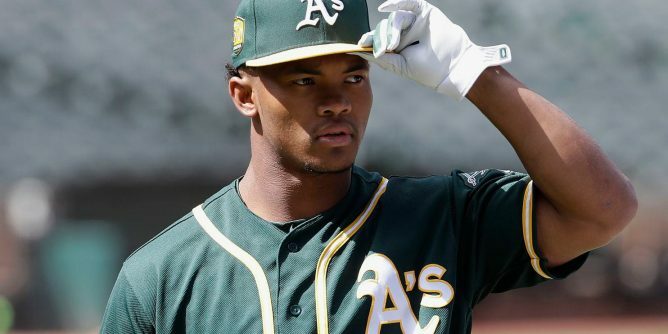 Kyler Murray has until Monday to decide whether to declare for April’s NFL draft and Sunday found the Oakland A’s prospect possibly playing a little hardball. Per reports, the 2018 Heisman Trophy winner is telling the A’s and MLB officials that he wants more money to pass on continuing his football career. Drafted ninth overall in June as an outfielder after showing impressive improvement while playing baseball last season for Oklahoma, Murray was allowed by Oakland to return to school in the fall to start at quarterback for the Sooners, and the result was a stellar campaign as the successor to 2017 Heisman winner Baker Mayfield. That has some NFL executives said to be evaluating Murray as a likely first-round pick, and the A’s were reported earlier this week to be expecting him to declare for that league’s draft by Sunday. According to a report Sunday by the San Francisco Chronicle, the A’s still “fully expect” that to happen by Monday’s deadline. That would not rule out Murray ultimately choosing baseball over football, though, and team officials and MLB marketing personnel are trying to convince him to do just that. The Texas native, listed at 5-foot-10, 195 pounds, agreed to a $4.66 million contract with Oakland last year, but it could take considerably more to put a glove and bat in his hands.